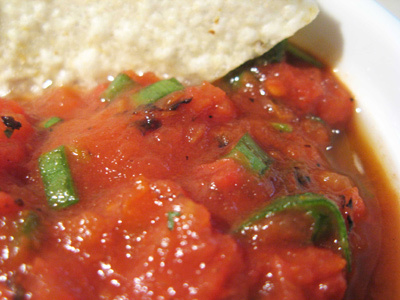 I may be proud of my Salsa more than any other recipe. It’s evolved over the years and tastes different based on the tomatoes I have on hand. Fresh garden tomatoes are the best of course, but there’s only a short period of time when I have them on hand. So on those occasions when I have a craving and no fresh tomatoes I have to go with canned tomatoes. I’ve found that the fire roasted tomatoes have a slightly smokey flavor and are a bit thicker which makes a better consistency. 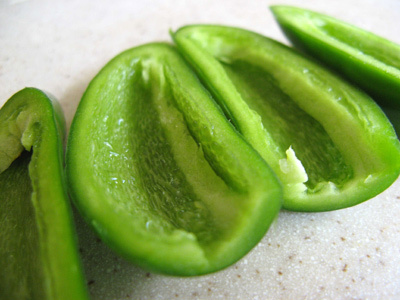 Along with the tomatoes, I include green onion tops, jalapeno, green chile, garlic, cilantro, lime juice and salt. 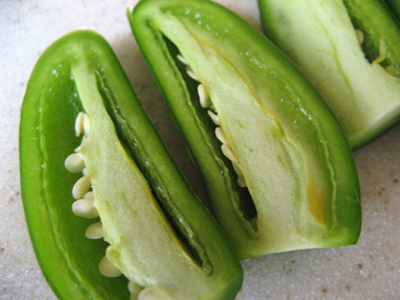 The ribs and seeds of the jalapenos determine the heat. For a milder salsa remove the ribs and seeds. Chop the onion, garlic, jalapeno, cilantro and green chile. These chile came from Hatch NM, and were roasted and later frozen. 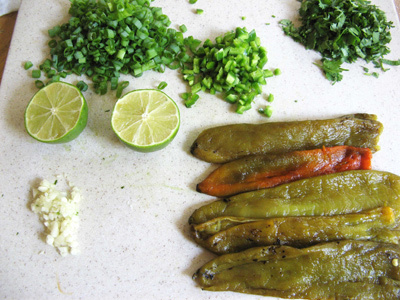 If you can’t get the Hatch green chile, you can roast Anaheim chiles over an open flame of a gas stove. Continually turn until the outer skin has charred on all sides. Place in a plastic bag and seal for 20 minutes. Once they have steamed they will peel easily under running water of the kitchen faucet. Or you could just buy a can of diced green chile. 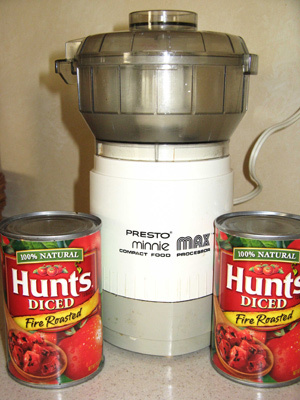 I like to run the tomatoes through the food processor for a few seconds to get the consistency just right for the salsa. Don’t want it too chunky or too thin. 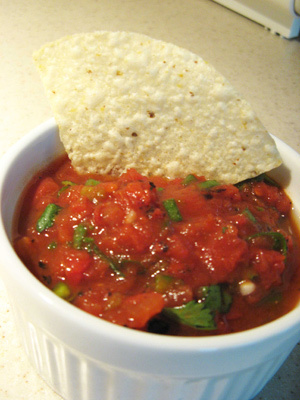 Add all your chopped salsa ingredients, spritz with juice of a half lime and salt to taste. 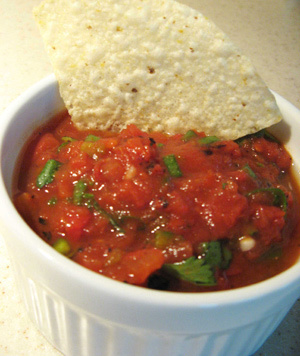 You better have lots of tortilla chips on hand because this salsa won’t last long. Combine all the chopped ingredients, set aside. 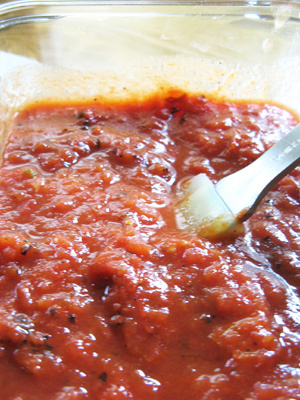 Run the fire roasted tomatoes through a food processor a few seconds. 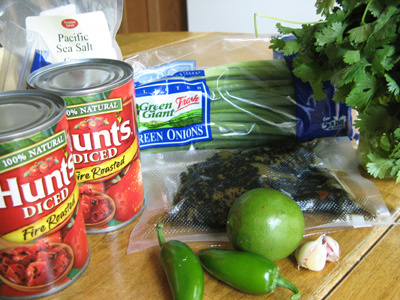 Once you get the consistency for the salsa, add the green onion, jalapeno, green chile, garlic, and cilantro. Mix together, spritz with lime juice, and salt to taste.